A recent national survey by Harris Poll reveals the cooling benefits of window film are unfamiliar to about 50 percent of Americans. According to the US Department of Energy, cooling and heating accounts for more than half of the energy use in a typical U.S. home, making it the largest energy expense for most homes. And roughly 40 percent of unwanted heat that builds up in a home comes in through windows. Window film can be professionally installed to existing windows to help upgrade them to today’s energy and safety standards. Once professionally installed, home and business owners can enjoy immediate benefits such as a lower energy costs, furnishings and skin protection from harmful UV rays, improved safety from dangerous glass shard from broken glass, at a fraction of the cost of replacement windows. 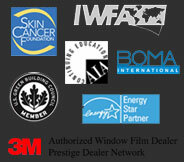 The International Window Film Association (IWFA) is a unified industry body of window film dealers, distributors, and manufacturers that facilitates the growth of the industry by providing unbiased research, influencing policy and promoting awareness of window film. The organization builds alliances with trade associations, utilities and government agencies to advance dealers’ and distributors’ businesses and provide value to their customers.